The most protean and prolific of artists, Dürer was the first to achieve European-wide fame through the use of prints. His early training as a goldsmith with his father in Nuremberg was particularly important for his development as an engraver, for it was at this time that he learnt the painstakingly precise craft of working precious metal objects with finely honed tools. The extraordinary minuteness and clarity of his style is the product of such instruction. of graphic perfection. The most erudite of the three is 'Melencolia I' – a puzzling image that has inspired a vast amount of commentary. The great art historian Erwin Panofsky famously described it as a ‘spiritual self-portrait’ of Dürer himself. 'Melencolia I' speaks to us in the language of visual allegory. It bristles with motifs and symbols, some of which represent precise ideas, while others resonate with ungraspable significance. In the foreground, a sluggish figure sits on a stone slab in front of a section of wall and stares into space. With her face slumped in her hand (the conventional pose of the melancholic) and her magnificent wings folded in earthbound passivity, she embodies the dark temperament. Her swarthy features also suggest her emotional state. Even the strange setting, featuring an expansive coastal landscape below heavens framed by a lunar rainbow and pierced by a comet, is tellingly nocturnal. Strewn around the winged figure is an assortment of tools and instruments relating to geometry, architecture and artistry in general. These include a moulder’s form, a plane, a saw, a ruler, nails, the mouth of a bellows and, on the left, an inkpot and pen case, a hammer and a goldsmith’s crucible with tongs. Hanging on the wall are a pair of scales, an hourglass and a bell. The magic square – where each row of four figures adds up to 34 – is often explained as a Jovian talisman. The numbers in the bottom row show the date of the engraving. The bewildering array of objects depicted in the print is testimony to Dürer’s profound interest in theories of proportion, calculation and measurement, which culminated in his book on geometry published in 1525. The stone octahedron dominating the left side of the composition is an expression of the artist’s sheer delight in creating unusual geometric forms. 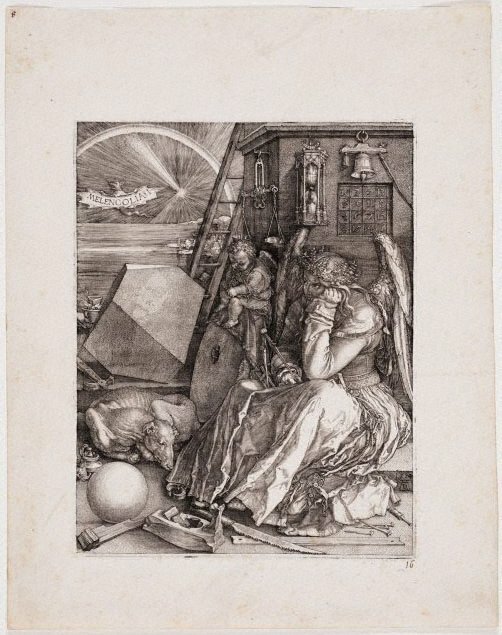 Geometry (one of the seven liberal arts) represented for Dürer the very foundation of artistic endeavour, a quasi-mystical discipline through which he hoped to approach perfection in his work. It is not insignificant then, that his protagonist should hold a compass prominently in her right hand. ‘The art of measurement’, he wrote, ‘is the correct grounding of all painting’. Since antiquity, melancholy (from the Greek μέλαν-χολή, melan-chole, literally ‘black bile’) was understood as one of the four cardinal humours, the others being yellow bile, phlegm and blood. These bodily fluids determined an individual’s emotional and physical state: melancholic, choleric, phlegmatic or sanguine. Each of the humours was attuned to one of the four elements, one of the four seasons, and one of the four times of day. According to Renaissance cosmology – which loved to draw parallels between the ‘microcosm’ of the human organism and the universe – the humoural makeup of an individual was ultimately decided by the planets. Thus humans were affected by the dispositions of the various celestial deities after whom the planets were named. Melancholic types, for example, were dominated by the brooding influence of Saturn. Furthermore, they were associated with the element of earth, the season of autumn, the time of evening, the life phase of maturity, and the qualities of cold and dryness. Thus the wreath of medicinal plants crowning the woman’s head in Melencolia I has been interpreted as a curative to the effects of the latter. The Renaissance Neo-Platonists reassessed melancholy, elevating what had in earlier times been construed as an illness or vice to the level of a divine gift associated with exceptional creative ability. Marsilio Ficino’s 'De vita triplici' (1489) was the foremost text to assert the connection between artistic talent and the saturnine temperament. It is precisely the uneasy affiliation between superior imaginative prowess and melancholy that underlies the significance and novelty of Dürer’s astonishing image, the first to give pictorial expression to the new ideas concerning the nature of artistic genius. For despite its ennobled form, melancholy remained a precarious gift as it could lead to despair and insanity. While it alone inspired the imagination to soar to its greatest heights, it also presented a formidable obstacle to the realisation of creative potential. Signed and dated l.r., incised plate "1514/ AD [artist's monogram]".